Ubimax GmbH, a leading manufacturer of industrial wearable computing solutions, is entering a strategic partnership with soft2tec GmbH, under its tracking solutions brand name “nexonar”. The focus of this cooperation is the combination of Ubimax' Smart Glass solutions with the innovative measuring and tracking systems of nexonar. This allows the automatic pick-up detection by “nexonar” a significant improvement of the order picking processes of the world's leading vision picking solution “xPick”. The same optimization offers the bringing together of “xMake” and the automatic activity detection of the “nexonar Assembly Scout” for various production processes. Bremen, October 10th, 2016: The first milestone in the new partnership, the connection between the two systems, has already been successfully implemented. Since the beginning of September a German car manufacture has been testing the systems in several locations. With the merging of the systems, the nexonar and Ubimax Team can offer new innovative logistics solutions, which will be effectively implemented after a successfully completed test phase at the various plants. “xPick” will be used, together with nexonar, to support order picking processes. Along with manual order picking, incoming goods and outsourcing, the sorting of goods as well as inventory management and shortage management are also supported. With the integration of “nexonar” the information obtained by the automatic pick-up detection is sent via a server to the Smart Glasses of the operator. At the same time the movements of the operator can be captured, by means of a wrist-mounted IR tracker and an external camera. This “hands-free” combination of augmented reality and high-precision tracking hardware provides a significant improvement in working speed with a reduced error rate. 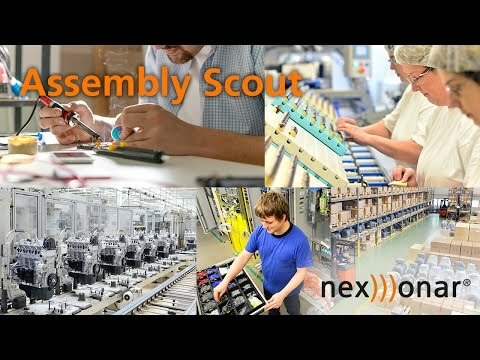 The unique combination of “xMake” and the “nexonar Assembly Scout” offers competitive business advantages on the shop floor. “xMake” is one of the Ubimax developed innovative “make-by-vision” solutions for production, assembly and quality assurance. All relevant data, confirmation mechanisms and documentation capabilities are always directly in front of the eye of the worker. The meticulously working and scalable technology of “nexonar” configures and monitors 3D control areas or access sequences. In this way, complex scanning operations, stationary PCs or more expensive and inflexible Pick-to-Light modules are made superfluous. Ubimax is a Leading Supplier for Industrial Wearable Computing solutions creating fully integrated solutions powered by latest wearable computing technologies to improve business processes. Its Enterprise Wearable Computing Suite includes xPick for order picking, xMake for manufacturing and quality assurance processes, xInspect to support service and maintenance technicians and xAssist for remote assistance functionality. With offices in Germany, the U.S. and Mexico, over 10 years of experience and an extensive track-record in the fields of Wearable Computing, Augmented Reality, Mixed Reality and Sensor Systems, Ubimax serves more than 100 customers today and is a clear forerunner in the market.